When we heard that Sir Ian was coming to Nelson to do a show at the Theatre Royal, we thought it would be the perfect opportunity to invite him to the workshop. Some of the Fellowship have visited us before, and have their own copies of the ring we designed and made for Lord of the Rings – but Sir Ian didn’t. So we devised a plan to tempt Gandalf with a little golden gift! Sir Ian came to visit on Saturday afternoon. I told him the story of how my father, Jens Hansen, designed and made the ring for the movies after being approached by Peter Jackson. We showed him some of the prototype rings, the big ‘stunt ring,’ and one of the limited edition 'Sauron sized' rings. Then we offered him his own ring. He whispered: “Don’t make me, Frodo!” but held out his hands immediately. 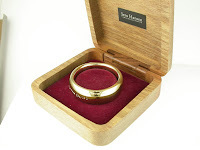 We had to size the ring, which is made of 9carat gold, especially for him – and he asked to watch it being made. Our jewellers got to work, customising the ring for Ian. Ian even took up the hammer himself! On Sunday afternoon, I went to see Ian on stage at the Theatre Royal. 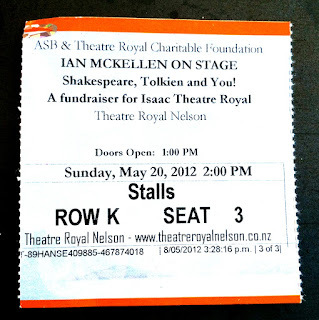 During the first half of his show, he shared his experience of Middle Earth and being part of the Lord of the Rings. He had his ring on and kept playing with it, it looked gorgeous in the stage lights. We were very honoured. The second half of the show was a performance based on Shakespeare, and then Sir Ian spent a few minutes with us afterwards. All in all, a fantastic weekend to be part of the Jens Hansen legacy.